Melton Hill development – attack of the giant cheese wedges? What on earth is happening down at Melton Hill, with the old Suffolk Coastal District Council office site? Now people are asking how – and by what stretch of whose fevered imagination – has this consensus magically transformed into the below (current) plans for Melton Hill? Melton Hill current plan: Docklands-by-the-estuary. Giant 5 &6 storey cheese wedges – suitable for an urban setting but out of place in tiny Woodbridge, dwarf the town and overlook all neighbouring housing as well as impacting badly on the historic Sutton Hoo views. All old buildings, trees and even the Drummer Boy have been demolished, cut down and removed in favour of giant 5 &6 storey cheese wedges – suitable for an urban setting – that will dwarf the rest of the town, impact adversely on National Trust’s historic views of the riverside and town from Sutton Hoo , alter completely and irrevocably the skyline of the town, and create a completely mendacious ‘piazza ‘ area pictured as a bustling metropolis with people dashing to and fro. Strange. After all, who, apart from residents, is going to be walking in this large open space, and why? We may suspect we are not in Kansas, Toto – but this is not Docklands . To top it all there is not enough parking allocated for the – greatly increased – (now there’s a surprise – how often does that happen in Suffolk?) number of residential units planned. How will this impact on a town already chronically short of parking , and where the District Council Offices have traditionally opened their car parks at the weekend for public events? And who will be able to afford to live here? So what should you do if you are concerned? I would urge the residents of Woodbridge to take this matter up with their District Councillor – but the democratic deficit that exists in this area since the last boundary changes is so egregious as to hardly need mentioning. Instead of the four councillors you had- one for each ward (Farlingaye, Seckford, Kyson and Riverside) -you now have three for a larger Woodbridge and district: Cllrs Hedgeley, Holdcroft and Mulcahy – all of one party, by your express wish. By an arrangement they have between themselves, Cllr Hedgley deals with the rural villages, leaving Woodbridge town represented by Cllrs Holdcroft and Mulcahy. And Cllr Holdcroft (amidst a proliferation of other hats including Town Councillor) is SCDC Cabinet member and on the SCDC Planning Committee and is therefore unable to comment on planning matters. As I say, this leaves you with a sgnificant democratic deficit. All I can therefore do is to suggest you approach your one remaining available District Councillor -Cllr Mulcahy- to tell her what you think and ask her to take action on your behalf over this! I didn’t realise Dr Seuss was moving to Woodbridge. Could someone please reconsider this monstrosity? Just out out interest – have all the family jewels been sold? What percentage of Riduna Park is actually owned by the Council? Why have the plans changed so dramatically from the original certainly not in keeping with the surrounding area far too high! This is totally outrageous and out of place. I for one shall voice my concerns with Cllr Mulcahy. Ugly this is Woodbridge who has the right to knock down existing building.We need property for local youngsters trying to stay near family. All these so called modern buildings are not suitable for Woodbridge. More affordable homes to buy and rent . There is a horrible degrading name now (social housing) the old council/ housing association houses but that’s what we need to keep locals local. The town is only being affordable for older non Woodbridge residents. Council need to wake up and not keep accepting hand outs. To many luxury places so out of touch with our town. If you dont stop this there will be no Historic town in peoples memories, instead it will be modern art badly done and soon will look as outdated as it looks out of place !!! As can be seen by the development at the waterfront -in what appears to be an increase in the height of the development. The council do as they please. Not only is the town to put up with even futher building developments not inkeeping with its historic nature. But we are also about to have a silence shattered by the work for the windfarm. Towns need to be developed and maintained I agree. But if you are not listening to the people of the town who are you listening too. I can’t believe the council have changed so dramatically also I would like to point out the number of cars on the roads surrounding Woodbridge by all the new developments. This council is killing a beautiful town shame on them all . New housing is needed and by definition it will be modern, but there are much more stylish and imaginative options than these blocks. As mentioned parking is essential and as usual community opinions are ignored, just like with the neighbourhood plan , in favour of control by the councillors who always seem to go for developers money as opposed to what’s best for the town. Why do all new buildings have to ‘stand out’? What’s wrong with blending in with the surroundings sometimes? This looks like a new university campus and is totally out of keeping with its location. Who’s views are more important – the developer’s or the residents’, who will have to live with this for the next century at least? Yet again another money led development opportunity which will benefit only the property developer and no doubt the councillors involved in it. The council has ruined the riverside with the development there and is now intent on ruining the road into woodbridge. All part of Agenda 21 where no one apart from the rich can afford to buy property. As a local i can no longer afford to live in woodbridge so am having to move further out. Sad, sad time for Woodbridge and those in the know should be ashamed of themselves. Clearly this scheme is all about maximising river views and the profit they attract. I’m all for challenging the status quo, I quite like the riverside development (although I loathe what’s happened across the road), but this is shameless. How do we set up a petition to this. This is plain stupid. I don have any other word for it. What is wrong with the council. I have only lived in Woodbridge for 6 years and this is not ok. The ultra modern design is not in keeping with our town and frankly I cannot even understand how this happened??? 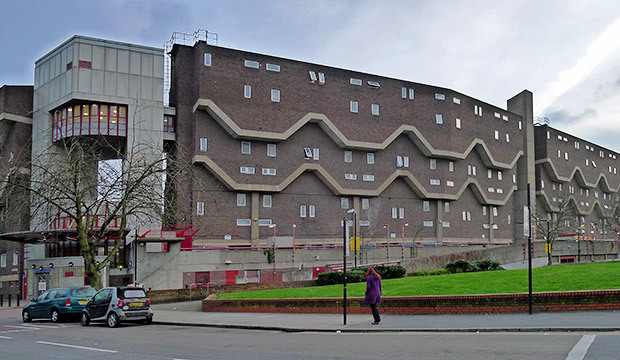 In tone they remind me of Southwyck house in Brixton which was built to run alongside a motorway that never got built. 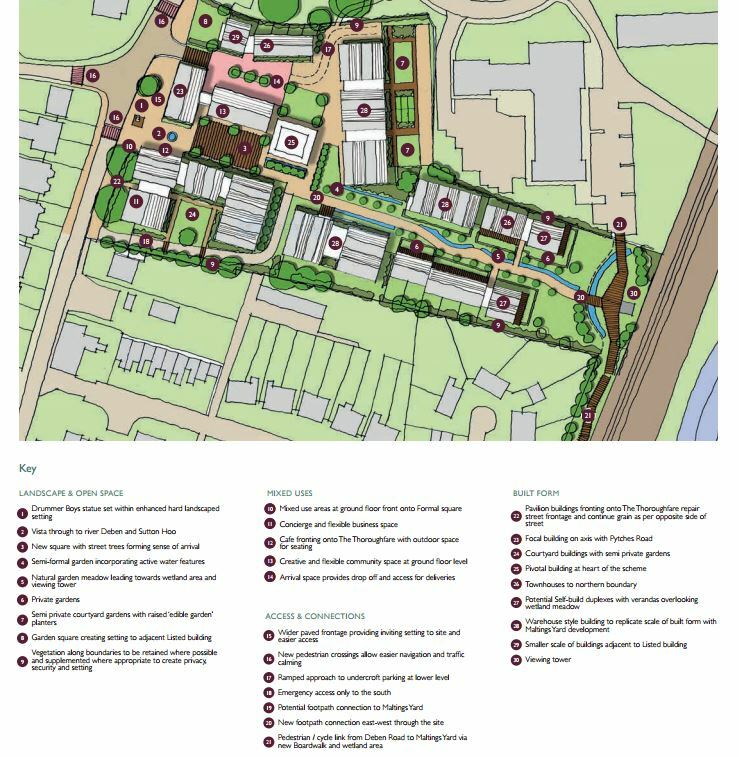 I am so very disappointed to see the unimaginative and frankly lazy set of designs as proposed for this new development in the grounds of the old council offices. 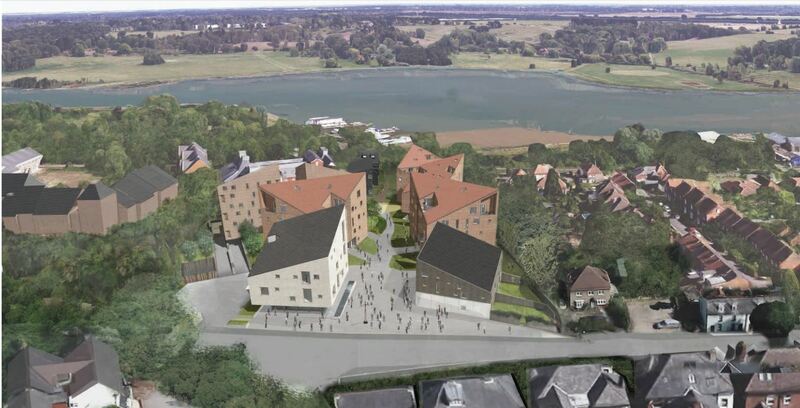 Do we really want the banks of the River Deben to be lumbered with a 1950s estate looking like something from an Eastern European housing cooperative? Woodbridge is truly a gem, and attracts hundreds of visitors annually; this is because buildings have been put up for centuries with care and thought by the locals which reflect their times and circumstances. This proposed development will do nothing to improve the built environment at all. The current development going up on the waterfront in the old boatyard already looks like something built to incarcerate North Korean prisoners. Architects always seem to want to “make a statement” whatever that may mean, an oft repeated and frankly vacuous bleat. The current vogue for brutalist, pseudo-post industrialist architecture which is being inserted along the Woodbridge waterfront is beyond inappropriate. I am not suggesting that buildings should be pastiches of past vernacular styles, and no Poundbury is wanted here. Modern design does not have to be like this. Where are the inspired and truly creative architects and designers? Where are the people who can design buildings of which a community can be proud? Where are the buildings which celebrate the best of the present and look forward to the future without forever recycling tired old clichés? (The new council offices already look like a Black Sea holiday camp.Timber cladding!?) Surely we want to create an environment of which the town’s inhabitants can be truly proud? 100 years from now the Shire Hall, St Mary’s Church and many old listed buildings in Woodbridge will still be standing but what will this proposed development and other recent witless buildings look like and tell the inhabitants in 2117? Come on Woodbridge surely you can do better than this! I sincerely hope you can. Or perhaps you can’t…..